A photo of the framed-up 'Broken-hearted Zombie Dream' (which will be shown in Zombie Apocalypse at Blackbird Studios, Las Vegas in October). 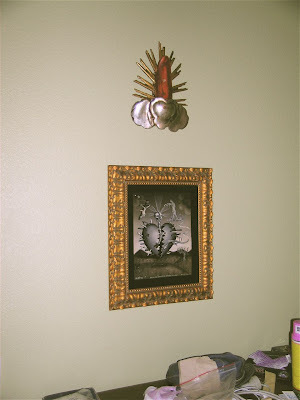 I've hung it below a wooden carved polychromed sculpture of St. John of Nepomuk's tongue - a wonderful gift given to me by a wonderful friend! You can click on the image below to enlarge it.